So many things we did this weekend. The Overdue Recap gets you through Saturday. I was soooo exhausted. Whew. The husband and I did something incredibly enjoyable. And for the very first time. You know you're a mom when going to the movies with your husband while your child is at a drop-in childcare place is a monumental event. The child turned six but a week ago. We had NEVER EVER done that before. On a SUNDAY afternoon, people. I CAN'T STOP USING CAPS. We dropped her off. She cried. She cries at nothing like this ever. I think she was over-tired. Exhausted. Read that recap again. See how much this kid did on Saturday? You'd be tired, too. And you'd have a sugar crash like nobody's business. So we dropped her off and she teared up some, but it was still awesome. She enjoyed herself and after the movie we hit the bookstore for a short bit and went our separate ways and neither of us had to go to the children's section or the train or Lego area or anywhere we didn't want to go. AT ALL! When we went to pick her up my husband was feeling guilty. Me? I was thinking ahead and trying to figure out when we can do it again. It helped that she really didn't want to leave. To the point that she held onto the pole outside of the location for a few minutes, pulling an over-exaggerated 6-yo routine. She was whiny and cranky at dinner, which we did early and out, and I enjoyed A LOT, even with her crankiness. It's amazing what a few hours of Die Hard #900 can do for you when you're watching sh*t blow up and stuff and not fighting for the popcorn. So I went to the movies with my husband. Without my kid. Consider linking up with me today to share some of your own moments of motherhood. 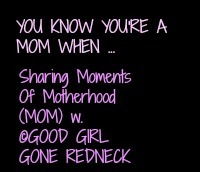 Good, bad, in-between ... we all have those you know you're a mom when moments. What are yours? What is this drop off movie theater magic place of which you speak? I have never heard of such glory! But I see that Ashley says one is opening near us, so I must be completely out of the loop. GOOD FOR YOU! Such a huge deal that you and hubs made time for yourselves! Paul and I haven't gone to the movies since having kids. That's so fun that you went! I don't think we have any drop off kid care places like that here. Love this! Movies in the afternoon is so decadent! We carted the boy child to America for some shopping. I'm surprised that I didn't leave him there. Kidding...sometimes. Good for you!!! Moms need a breather now and then... we shouldn't feel guilty about a little "me" time! My kids are a bit older and I still need a break once in a while! Good for you! I've only spent one night away from my 18 month old (when my husband had surgery, so not for fun) and I'm really looking forward to spending our first night away in an enjoyable way. These firsts are just as fun to celebrate as the baby's milestones. My parents have been a Godsend when it comes to watching my daughters so I can get some alone time to do whatever! I'm glad that you and your hubby were able to do the same! PS. I saw Die Hard this past weekend too! Stopping in from SITS! I also linked up! I adore--simply adore-- time without my kids. Just for little while, to breath. I can't get the linky to work! And the post was totally inspired by you!